Infographics have always been a key visual aid in print and digital media. Not only do they create a better statistical understanding for the subjects they’re used in, but they’ve also become sort of an art form due to the many ways these graphics can be portrayed. 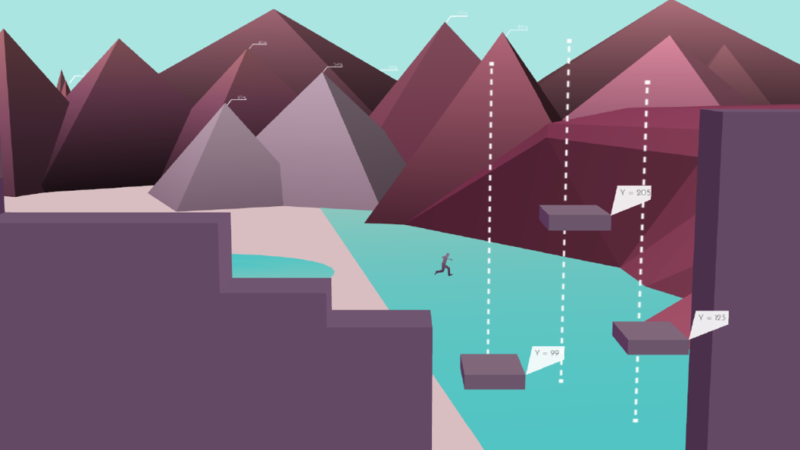 Now infographics have found their way onto the Vita in the form of the puzzle platformer Metrico, which should further change the way people look at these visual aids. 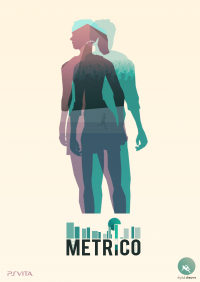 Designed by new independent development team Digital Dreams, Metrico is a sidescrolling puzzle platformer that uses infographics and geometric statistics to make players think before, during, and after the process of inputting user commands. On the surface, Metrico is a simple platformer in the sense that you’ll traverse from left to right in an attempt to reach the map’s ending, going through various obstacles as well as destroying and avoiding hazards along the way. However, once you start playing, the game throws all sorts of curveballs, allowing for quite a unique experience. Metrico‘s gameplay nuances are really hard to explain in words, mainly because simple actions can manipulate each stage’s interactive parts. 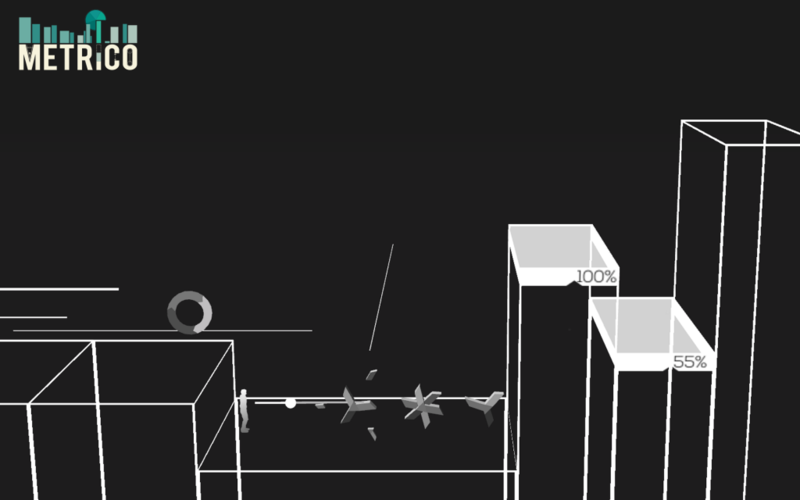 For example, looking at the situation in the header screenshot at the top, in order for the player to get from the left to the right, the jumps have to properly be timed. The longer the character is off the ground, the more the platforms will move up or down the Y-axis. Moving to the left would and jumping can also affect the platforms’ movement. The situation shown in the screenshot directly above is also pretty confusing. Eventually, you’ll get to this point in the game where your character can fire projectiles at enemies like the bladed asterisks you see pictured. However, these can also drastically change the stage. Simply firing will cause one of the bars on the graph on the right hand side to raise, while actually killing one of the enemies will cause the other to raise. The player ideally wants to keep the left bar as low as possible, while raising the second bar to a high enough point to continue on through the course. 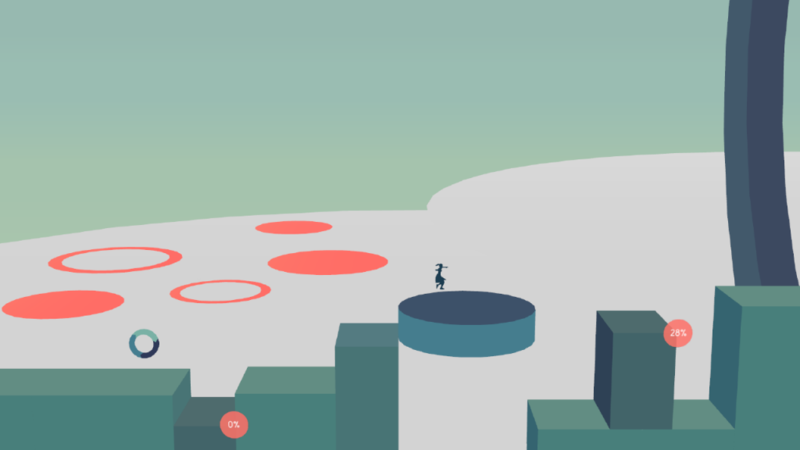 Should the player make a mistake, which will definitely happen, you can start over from the last checkpoint (indicated by the rotating circle to the left of the character on the screenshot above) by pressing the circle button. Players that keep at it will also be introduced to inputs that’ll require the player to use the touchpad on the back in addition to the touchscreen itself, further increasing the need for the player to have good reflexes and dexterity. While this does significantly increase the game’s overall challenge, the pacing is done quite well. When finishing a level, the player will also have one of two paths to take and if you’re online either via Wi-Fi or 3G, you get to see what percentage of players chose which level. I’m not particularly sure if it relates to challenge, but it’s pretty cool knowing that you can just go with the flow of everybody else playing the game or to just take the unbeaten path. Going with the game’s puzzling nature are the psychedelic sounds and tunes of the dutch composer Palmbomen. While the game has sort of a techno-like Tron kind of feel, the music sort of has that Daft Punk sound to it. It’s not overly excessive like the bass dropping you hear in EDM these days, but each level’s music and sound complement each level’s design quite well, making for quite a pleasurable experience when playing with headphones. It’s said all the time, especially with games in the indie scene, but Metrico is quite a unique experience. The fact that I even had to use the screenshots to talk about specific gameplay features shows that to really have an understanding of the game, it has to be played. As a former multimedia editor for my high school newspaper, I’ve always known the value of infographics but I’ve never found them so puzzling and enjoyable until after playing Metrico. The game makes fantastic use of almost all the Vita’s features, and it really benefits from being a handheld game enjoyable in spurts. Metrico is exclusive to the Vita’s PlayStation Store and is priced at $13.99, but PlayStation Plus members are entitled to the game for free this month. If you’re still on the fence about the game, Metrico‘s first level is available for free, encouraging Vita owners to decide for themselves whether the game is worth it. Free demo or not, Metrico is definitely an exciting title that doesn’t need fancy graphs to prove that it is.